A Churchill 'Quote' That U.S. Politicians Will Never Surrender : It's All Politics Winston Churchill's backhanded compliment to Americans — that they'll always do the right thing, after trying everything else — is often repeated by members of Congress. There's no evidence that Churchill ever said it, but don't expect that to stop politicians from quoting it. Winston Churchill opens the new headquarters of a Royal Auxiliary Air Force squadron at Croydon in 1948. This week, Congress dedicates a new bust of Winston Churchill in the Capitol's Statuary Hall. The sculpture is meant to honor the British statesman's legacy of determination and resolve. It's also a salute to Churchill's friendship with the United States — summed up in an oft-quoted line that Maine Sen. Angus King used during the recent congressional debt-ceiling debate. As King put it: "Winston Churchill once famously observed that Americans will always do the right thing, only after they have tried everything else." While there are whole volumes dedicated to Churchill's famous sayings, it's that backhanded compliment to America that's especially popular among politicians on this side of the Atlantic. Republican Reps. Paul Ryan of Wisconsin, Tom Cole of Oklahoma, and Jaime Herrera Beutler of Washington are just a few of the many American lawmakers who have borrowed that line to add gravitas and a bit of humor to their speeches. Sen. Mark Warner, D-Va., often turns to the Churchill quote to provide a lighthearted conclusion to an otherwise gloomy message about the U.S. debt burden. Warner used the line so often, in fact, his staff decided to put it on a plaque or some other memento. But when they went to research the origins of the line, they came up empty, despite blood, toil, tears and sweat. "I wish I could substantiate that he said it. But so far, I cannot," says Richard Langworth, editor of the journal Finest Hour, published by WinstonChurchill.org. Langworth has combed through millions of words written by and about Churchill and found no evidence that the former prime minister ever said that about America. But Langworth says that's not unusual. 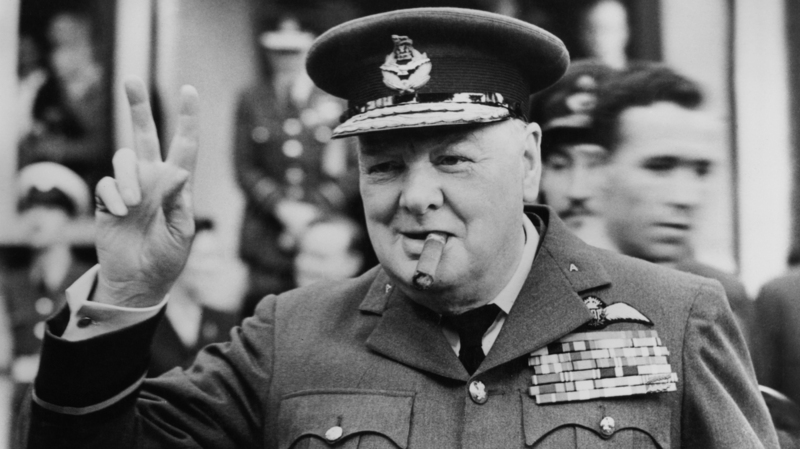 Like Mark Twain or Yogi Berra, Churchill didn't say half the things he's supposed to have said — including the famous comeback to Lady Astor, who supposedly told Churchill if they were married, she'd put poison in his coffee. "And Churchill supposedly responds to Lady Astor, 'If I were married to you, I'd drink it.' But that turned out to be F.E. Smith, Lord Birkenhead, Churchill's very, very dear friend, who was much faster off the cuff than he was," Langworth says. "But, of course, because Birkenhead is forgotten, it's been ascribed to Churchill." Nigel Rees, the host of the long-running BBC quiz show Quote ... Unquote, found so many examples of this oratorical identity theft that he coined a phrase for it: Churchillian Drift. "What I meant by that was, people — if they don't know who came up with a remark originally or if they can't be bothered to look it up — they automatically ascribe the quotation to somebody who likely said it," Rees says. "And obviously Winston Churchill is a very quotable person. He did say some marvelous things in a very special way." Thanks to the Internet, Rees says, it's easier these days to check the validity of famous quotations. But it has also gotten easier to spread misinformation. "If but one person puts on the Internet that Churchill said something — well, then it gets repeated by about 200 other people," he says. When Warner's staff informed him that Churchill never uttered those words about America reliably doing the right thing, eventually, Warner was only a little bit sheepish. "If Churchill didn't say it, he should have," Warner says. That's because the line reflects an underlying optimism in the way Americans see themselves, Warner says. "Sometimes it takes us stumbling around a little bit, but we ultimately get to the right place," he says. "And Lord knows, we've done an awful lot of stumbling around in the last few years." So even if this particular line wasn't Churchill's finest hour, don't expect American politicians to stop quoting it. They'll quote him on the beaches. They'll quote him in the streets. And they'll never, never, never, never, never give in.